"Just wanted to thank you two for doing a great job on the Radiant Off-Road Banner and T-shirts. We are excited to show them off at our Group Night at Radiant Church tomorrow night! We will be taking orders on more t-shirts in the near future and would like you guys to do those for us as well." "Thank you for your support of our Metro Classic Car Show and everything you did to make the show a success! We really appreciate your participation in our event to get more people into our Metrocenter area and help improve the public perception of the area. It was a great event and a lot of fun! We are beginning to plan for a Fall 2013 Metro Classic Car Show and hope you will want to participate with us again." "The girls loved their cruise shirts and we were the hit of Knott's Berry Farm-everyone wanted to know where we got our cool shirts! Thanks again!" "Everyone LOVED [the shirts]. They were SO comfortable. And thanks again for getting them to us by our short deadline. You guys Rock!" "I wish I found this place sooner. 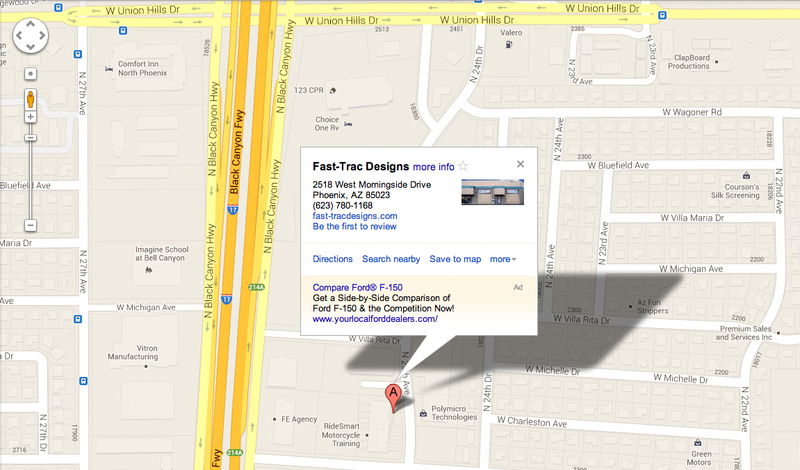 I discovered Fast-Trac on my phone's google maps. This place is great. They do just about everything involving printing. From vehicle wraps to business cards, this is my new one stop print shop. I met Judy about a week or so ago. She helped me get started on some custom mailer postcards. She was very professional, direct and honest. Within a few days Esteban emailed me my proof. We went over some changes, I signed the approval and my expected delivery was about a week. To my surprise, I received a call about 3 days later stating they had arrived. After a meeting with Sean, I could very well tell that this business was interested in helping local businesses like mine, develop a long, healthy business relationship with a reputable design and print firm. Thank you Fast-Trac. I'll see you again when it's time to order more." "Thanks Fast-Trac for the car magnets and t-shirts you did for Two Ladies in a Car! So cute and fun!!!" "I brought a shirt to Fast-Trac Designs for some custom print on the back. The price was perfect and they were able to meet my deadline. The screen print that they did for me was so great and I constantly get compliments on my customized shirt. I do plan on useing Fast-Trac Designs in the future. "Super informative writing; keep it up."